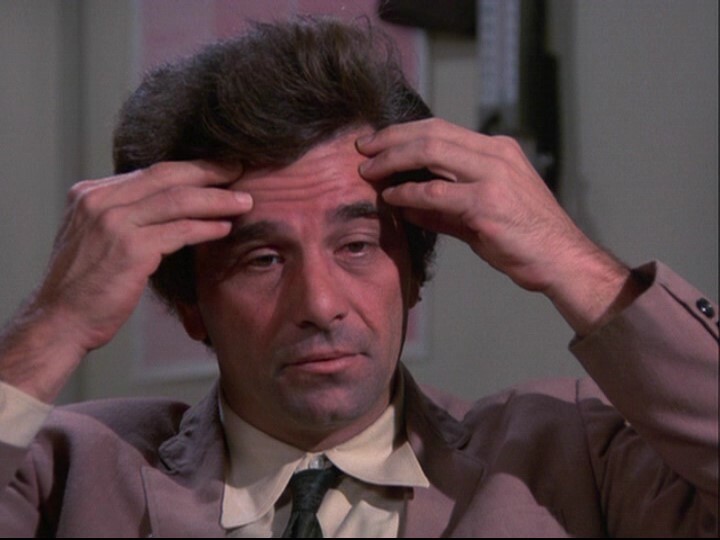 Last Sunday, while trying to figure out how to post on my blog from the old laptop that doesn’t have the same mindset as the new model (kind of like me), I missed the first half hour of Columbo. Vicki and I, unbeknownst to each other at first, had both gotten into the habit of watching the old ’70 show every Sunday night on one of those cable stations that runs TV programs of yore. I was so determined to deal with my new laptop already being in the shop for the next few weeks, and get this old guy going, I denied myself any rewards like turning on the television before the task was complete. Darn. It was about a murdering mystery writer played by Jack Cassidy (father of David) with Peter Falk in his most famous role (you know he was nominated for an academy award twice a decade prior). It was directed in 1977 by Steven Spielberg, who was all of 24 at the time. It was a good one, but I achieved my goal. Sort of. Not enough female killers on Columbo. I can only remember Trish Van Devere. I’m just babbling tonight. Nothing new to report. Oh, except that last Sunday I went out to brunch with my cousin wearing those size 10 jeans I said that I could squish into but not yet dare wear out, and had no regrets. I think I am no officially a size 10 again.